The first installment in a planned duology, based on Stephen King's popular 1986 book (of the same name); which was previously adapted into a two part TV movie miniseries in 1990 ('IT' was divided in to two chapters in the same way). This installment deals with seven children that have to fight an ancient evil being (in 1980s Derry, Maine); the sequel will deal with the children 30-years later, having to fight the same entity as adults. The movie stars Jaeden Lieberher, Bill Skarsgard, Jeremy Ray Taylor, Sophia Lillis, Finn Wolfhard (of 'STRANGER THINGS'fame), Wyatt Oleff, Chosen Jacobs, Jack Dylan Grazer and Nicholas Hamilton. 'IT' was directed by Andy Muschietti (who also helmed the hit 2013 horror flick 'MAMA'), and 'IT' was written by Chase Palmer, Cary Fukunaga, and Gary Dauberman. 'IT' has received nearly unanimous positive reviews from critics, and 'IT' is a huge hit at the Box Office as well. I absolutely loved 'IT' too. The story (in this updated version) is set in 1989 Derry, Maine. Several children have gone missing, including Bill Denbrough's (Lieberher) 7-year-old brother George (Jackson Robert Scott). Bill and his other preteen friends, a group that calls themselves 'The Losers Club', investigate the disappearances of George and all the other kids. They find that an evil entity, known as Pennywise The Dancing Clown (Skarsgard), is responsible for all the disappearances. In order to fight the monster, they must each confront their own worst fears. I read the book and saw the original TV miniseries, when I was a kid, and I was a big fan of both. I think this theatrical adaptation is about as good as you could expect from 'IT'. 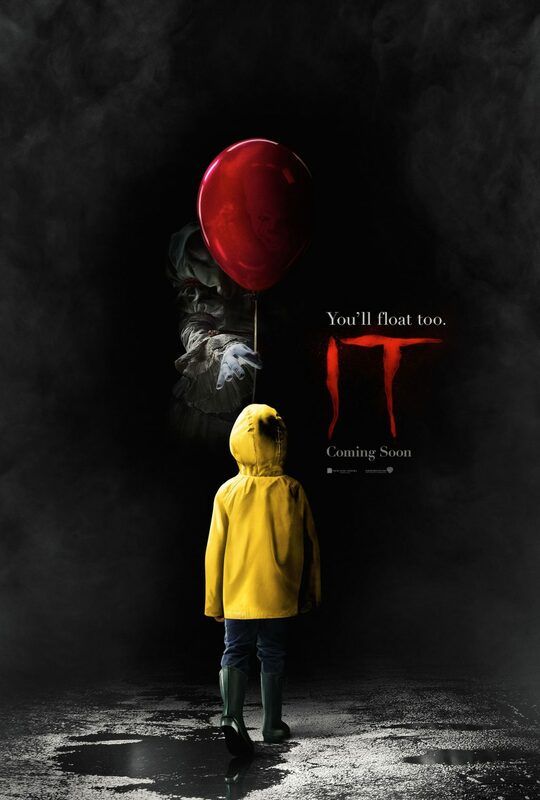 'IT' has a great 80s style 'kids on an adventure together' feel to 'IT'. 'IT' seems effectively scary, and it's also a good 'monster flick' action movie. Pennywise is a classic villain, and I'd say this version is about as good as the 1990 one (played by Tim Curry). The film is not as classic (for me) as the 1990 one, but I can't complain about anything in 'IT'. It's also great to see an R-rated horror movie become such a huge blockbuster at the Box Office; hopefully this means will get more R-rated horror flicks (instead of the routine PG-13 ones).